For a contribution of 20.00 a month (28.00 outside of the US), I'll be sending you a recording from somewhere interesting, each and every month. You will receive a CD in the mail, and regular monthly subcribers will also get a bonus CD now and then. These recordings were donated by Arc Music, so your subscription or one time purchase all goes to support the magazine and radio programs. We thank the artist and label for their generous support. Jedba shows that sufi music is not confined to mosques or zawiya (monasteries) but is an intrinsic part of everyday Moroccan life. 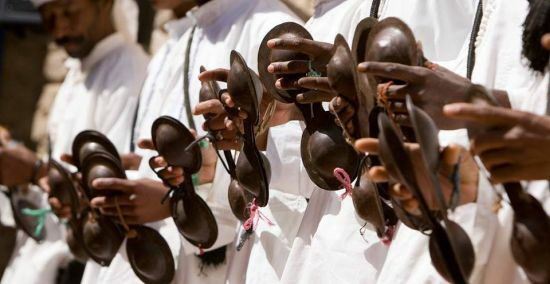 It is music from the streets, homes, marketplace and desert. Profound, mystical, compelling, entrancing… the entire album is a journey through the heart and soul of Marrakesh. It pays homage to the spiritual music and songs of urban and rural Morocco. Authentic mystical sufi chants with real depth, at times extended into trance-like repetition through the careful and skillful arrangements of co-producers Abdesselam Damoussi and Nour Eddine. Jedba includes performances by singers and musicians as heard on the streets, in a Tangiers mosque, and features a sufi master musician from the Atlas Mountains. The resultant music is as varied as the landscapes from whence it comes, yet always remaining true to its origins. 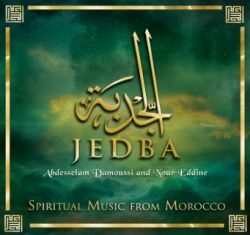 Jedba has been co-produced by two well-known Moroccan composers: jazz, hip-hop, rap, rock, world music and electronica producer Abdesselam (Abel) Damoussi and world music artist Nour Eddine, a contributing composer of the Vatican classical music archives.